“For years Simon Yearsley and I have been talking about how useful it would be to have good topo of Church Door Buttress. It’s a multi-faceted, two-tiered cliff, and it isn’t easy to keep track of where all the new routes go. But talking was about as far as we got until I bumped into Iain Small a couple of weeks ago at the CIC Hut. Helen Rennard was there too, so we spoke about The Prentice Pillar, and that gave me a great opportunity to get onto my Church Door topo hobbyhorse. 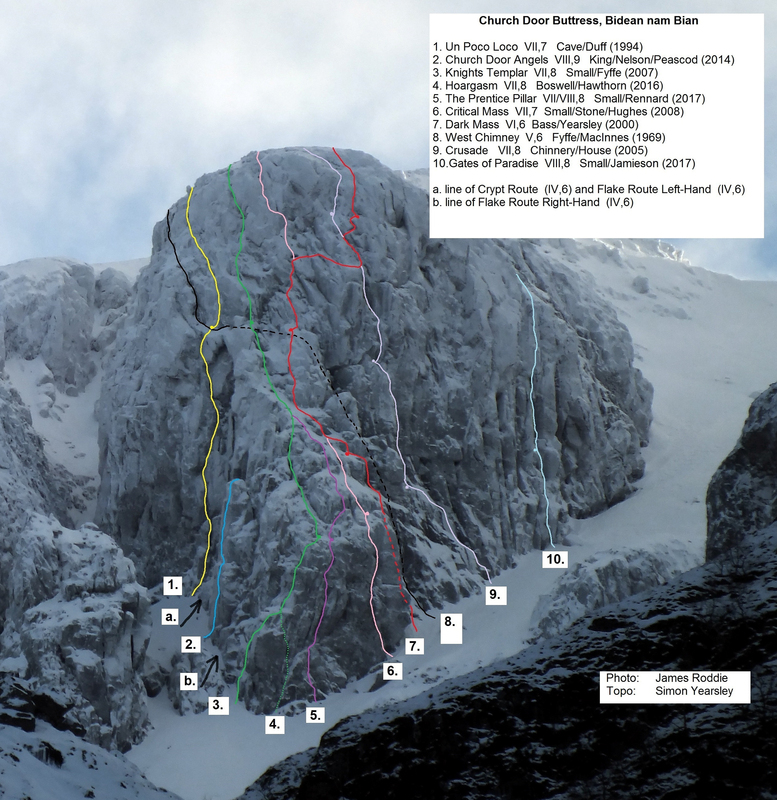 This entry was posted in Topos and tagged Bidean nan Bian, Helen Rennard, Iain Small, Malcolm Bass, Simon Yearsley. Bookmark the permalink. A fantastic topo, always wanted to know where Dark Mass went, having looked for it on crag previously! The original ascent of Un Poco Loco (Cave/Duff) started up chimney of Crypt Route, before moving left. The yellow line actually follows Crack Line, FWA Clark/McFarlane (2006). Many thanks Stuart – we’ll publish an updated topo in due course. Clearly your direct start to Un Poco Loco needs to be acknowledged on the diagram! Having climbed the original Cave/Duff line some years ago and more recently Stuart’s Direct start (mentioned above and full value btw!) into Es Tressider’s direct finish through the archway…I was pondering why they aren’t really described now as separate lines? Bar the top pitch above the arch they share perhaps only 20ft of climbing on pitch 2. In any other situation they’d be classed as separate lines. Perhaps it’s the way it is due to their bit by bit evolution? Both versions are superb routes.